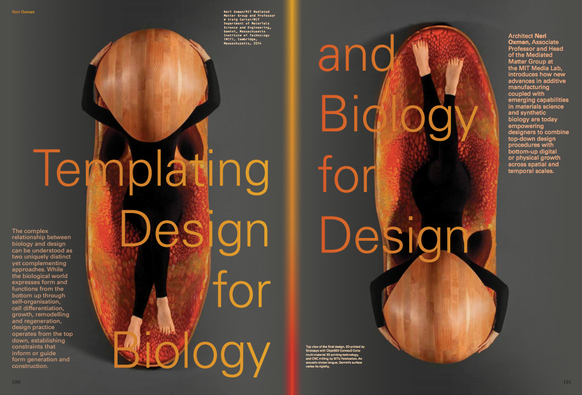 Templating Design for Biology and Biology for Design - Paper is out! From the website: A new understanding of the material in architecture is fast emerging. Designers are no longer conceiving of the digital realm as separate from the physical world. Instead computation is being regarded as the key interface for material exploration and vice versa. This represents a significant perceptual shift in which the materiality of architecture is no longer seen to be a fixed property and passive receptor of form, but is transformed into an active generator of design and an adaptive agent of architectural performance. In stark contrast to previous linear and mechanistic modes of fabrication and construction, materialisation is now beginning to coexist with design as explorative robotic processes. This represents a radical departure from both the trite modernist emphasis on 'truth to materials' and the dismissal of materials by the previous generation of digital architects. The issue features designers, researchers and thinkers that are at the forefront of exploring new modes of material enquiry and its deep interrelationship with technology, biology and culture. Through their work, which unfolds from multifaceted alliances between the fields of design, engineering and natural sciences, it seeks to trace the emergence of a novel material culture in architecture. Architectural and engineering contributors include: Sean Ahlquist, Martin Bechthold, Philippe Block, Karola Dierichs, Jan Knippers, Achim Menges, Neri Oxman, Steffen Reichert and Tobias Schwinn. Scientific and philosophical perspectives provided by: Mario Carpo, Manuel De Landa, Neil Gershenfeld and Thomas Speck. Features the design research of: Harvard's Material Processes and Systems Group, MIT's Mediated Matter Group.